So much for survival of the fittest – diversity is the key: a team of researchers from the Leibniz-Institute of Freshwater Ecology and Inland Fisheries (IGB) has succeeded in demonstrating experimentally that genetic diversity makes populations more resistant to disease. Why is it that animal and plant species throughout the world have different genetic variants within their particular species, even though it is supposed to be the "fittest" gene pool that survives? According to a common theory in evolutionary biology, it is to enable the species to respond more effectively to changes in the environment, such as the occurrence of disease. However, experimental evidence to support this theory is very difficult to obtain: After all, it is virtually impossible to observe how evolutionary trends develop in most animal and plant species – their generation times are simply too long. 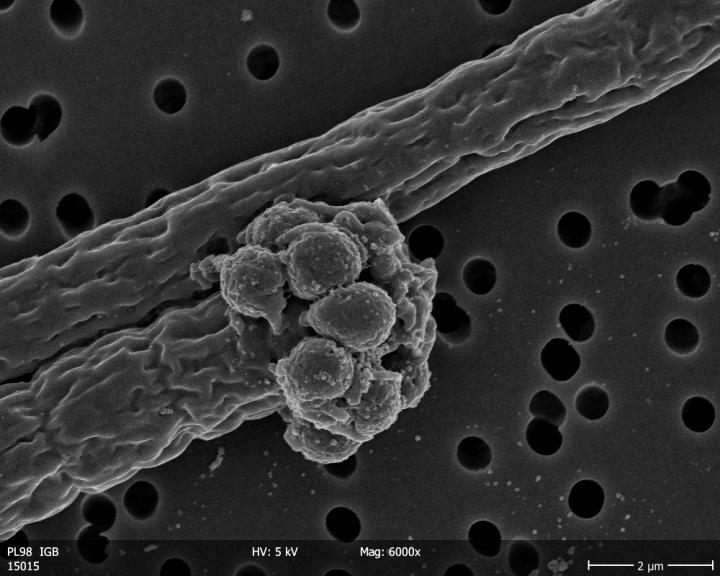 A team led by IGB researcher and evolutionary ecologist Dr. Ramsy Agha has now investigated the evolution of the fungal parasite Rhizophydium megarrhizum. This parasite infects the cyanobacterium species Planktothrix, which is prevalent in many freshwaters. The team exposed the parasite to host populations whose individuals were genetically identical to each other, and alternatively to populations comprised of different genetic variants. Since the fungus multiplies rapidly, roughly once a day, the scientists monitored its performance for a total period of 200 days. "We wanted to observe evolutionary change in real time and under controlled conditions, to find out if and how quickly parasites adapt to genetically homogenous and diverse hosts," explained Ramsy Agha. The scientists permitted the adaptation of Rhizophydium megarrhizum, but kept the host populations in an evolutionary standstill. "We were able to show that the fungi adapt to genetically homogenous hosts very quickly, that is within just three months," reported Agha. This adaptation is reflected in the fact that the parasites managed to adhere to the hosts and overcome their defence mechanisms more quickly, and were therefore able to reproduce more rapidly. "Our findings are also significant for ecosystem research in general, because they help us to explain why a high degree of diversity in populations may be valuable for their preservation," said Agha. He and his team want to investigate next what happens when not only the parasite, but also the host population is permitted to adapt to changed conditions. The researchers hope to gain further insights into how disease – generally perceived as a negative phenomenon – is a crucial natural process that promotes and preserves biological diversity.